Seven plots released for sale by the Graven Hill Development Company (GHDC) under a sealed bid auction have been purchased. The sites sold for prices between £270,000 and £354,000. Graven Hill is the UK’s largest self and custom build scheme and is set to accommodate up to 1,900 new homes. Plots will be released in phases over the next decade. 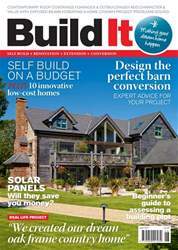 For more information about the project see our interview with GHDC’s interim managing director, Karen Curtin, on page 130, or head over to the Graven Hill zone at Build It Live Bicester on 10th & 11th June.